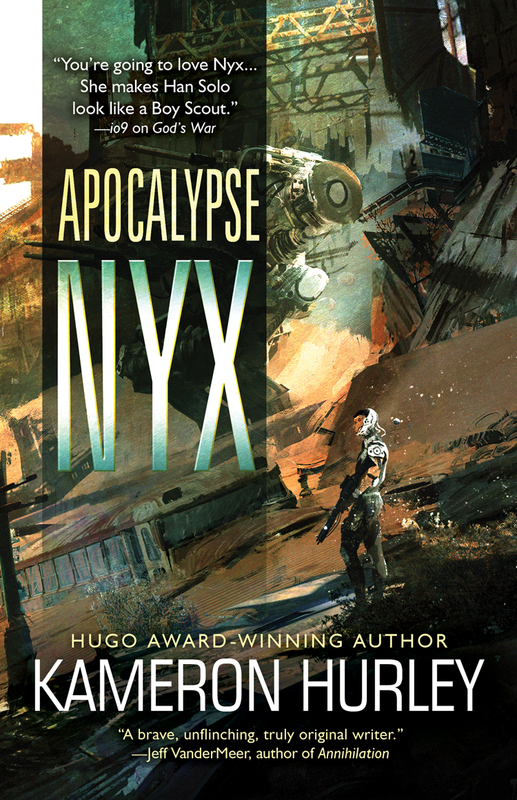 While lighter on plot than its novel predecessors, Apocalypse Nyx delivers on the action and the relationships that made the original trilogy so compelling. 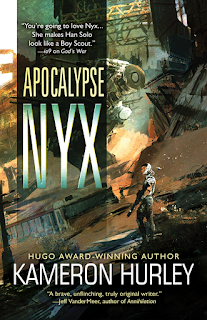 Six years after the publication of Rapture, the third volume in Kameron Hurley's Bel Dame Apocrypha trilogy, the world of God's War has a new print entry in Apocalypse Nyx, a collection of short fiction (two novellas and three shorter pieces) following some of the misadventures of bounty hunter Nyxnissa so Dasheem and her team of walking disasters. From mysteriously twice-dead corpses to fanatical biology researchers to awkward family reunions to ill-timed favour recalls, this new entry delivers exactly what anyone familiar with Hurley's previous work would expect, although avoids most of the political and interpersonal baggage that the original trilogy explored. There are five stories in this volume: "The Body Project", the opening story, was originally written as a "bonus" for the publication of Rapture, while the other four ("The Heart is Eaten Last", "Soulbound", "Crossroads at Jannah" and "Paint it Red") were originally accessible through Hurley's Patreon. All sit between the first and second acts of God's War, during the period where Nyx and her team are working as bounty hunters in Nasheen after her expulsion from the Bel Dame sisterhood of state sponsored assassins. It's the most minor of spoilers to note that this team looks a bit different after the events of the first book, and setting the stories in this period lets the characters be the versions of themselves that make the most sense in the episodic format. Moreover, the stories steer clear from all but the earliest spoilers of God's War (in fact, if you've read this paragraph all the way through, you've already been spoiled on that early event - sorry! ), so this would be a reasonable introductory volume for those who haven't read the original trilogy. As the title suggests, Nyx is the primary focus here, in all her destructive messed-up glory. I rarely find much to enjoy about morally adrift protagonists, but there's something about Nyx that makes her utterly compelling on the page despite being someone most of us would go out of our way to avoid in real life. Raised in Nasheen, a country whose population is overwhelmingly female because men are conscripted to die in an all-consuming religious war with the neighbours, Nyx herself has variously been a war hero, a casualty, a member of the elite Bel Dames, a convict, and now the leader of a team of individuals who are, by definition, out of options themselves if they've ended up working for her. Unusually for her location, three of Nyx's team are men, although all are from outside Nasheen, and the gender dynamics this introduces in the context of a nation where women are the only survivors makes for some fun moments. When I first read God's War, I'd never met a character like Nyx before, and I still think she's a rare creation: a woman who gets to be sympathetic while never doing more than the bare minimum to deserve it. To be fair, Nyx's world is so harsh that it makes sense for a reader to respect her purely for her ability to survive, and it seems inevitable that this is what someone raised in Nasheen -- a country where forty is considered elderly and people expect to die from chemical weapons or unpleasant cancers long before the real effects of age kick in -- would become. The rare flashes of something more honourable in Nyx's character keep us from giving up on her entirely, but these aren't the kinds of stories where a moral leaps out of the bushes and accosts our wayward heroes in the final act. There's no lasting development in the relationships or characters here; that isn't what you're reading for. This is particularly true for scenes that focus on the relationship between Nyx and Rhys, her "magician" (who, like much of the technology in this world, runs on bugs... just go with it). Rhys is a runaway from Chenja, the country Nasheen is at war with, and brings pomposity, piety and a pretty face to a team otherwise bereft of these "virtues". In Nyx and Rhys, Hurley takes that predictable but somehow irresistible (to me, anyway) sitcom relationship trope where two opposite personalities bicker and refuse to admit they "like" each other, and dials it up to a level of unapologetic toxicity which makes resolution impossible. If you're a fan of that dynamic (like me), this makes for a very compelling side plot, and while Nyx is certainly the more outwardly awful of the two, its equally hard to sympathise with Rhys' constant disgust and conviction that he is better than everyone around him. The relationship element isn't the primary driver of any of these stories, but it's a common thread throughout, especially in "The Heart is Eaten Last", and the interactions between these infuriating trash babies are perfect points of tension that add to the overall grimness of the world being described. I was worried that some of the politics and technology of Nyx's world might have escaped me in the years since I read Rapture, but I needn't have been. Hurley is brilliant at developing worlds that makes little sense on the surface (how are all those bugs powering their cars?) but where the internal logic and the matter-of-fact acceptance from the characters makes it easy to just take everything as it comes. The plots are sufficiently twisty, though not immensely complex or original - but, again, that's not really the point. Whether you're coming to Nyx for the first time, or after reading one or more of the novels, what Apocalypse Nyx offers is the grimdark version of a comfort read: action, well-placed aggression and bizarrely satisfying emotional frustration that will have you reading through your fingers. Nerd Coefficient: 7/10 "A mostly enjoyable experience".